Kiel is best known for its canal. Which I went to see, though not at Kiel but at Rendsburg. Had a nice day out there, went across the canal on a splendid ‘ferry’, suspended on cables below the high-level mainline rail bridge there, walked underneath the canal through the newish foot-tunnel with its seriously long escalators, walked though a part of the port and past a site scattered with huge bits of giant wind-turbines, ate currywurst and chips (our German hosts laughed at me) and ice cream, along with a beer. And took not a single photograph, as I’d rushed out without checking that I had a spare battery. I’d plucked the battery from the charger where I’d left it overnight and put it into the camera as we left in a hurry, assuming we’d be coming back shortly before the main trip out later. We weren’t, and although I’d left the battery in the charger all night, somehow it hadn’t charged. Perhaps I hadn’t plugged the charger in, or hadn’t put the battery in properly. So I had a camera, but without a working battery it was just a dead weight to carry around all day. Its a while since I’ve been out, at least further than a quick trip to the local shops, without a working camera. I might not always actually take pictures, but the potential is always there. So it did feel odd being without one, as if I was not properly dressed. I enjoyed the day, but think I saw far more opportunities for making pictures than I would have done had I been walking around with a working camera! 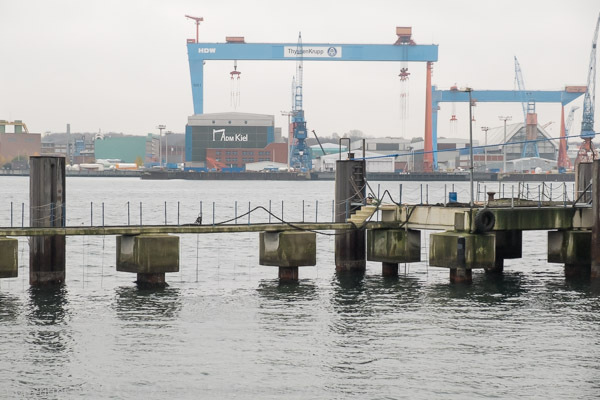 Earlier in the week we had visited Kiel itself – which isn’t really quite on the canal which starts a few kilometres north of the city centre. It was a grey, cold, windy day with occasional rain, and there were few others around as we walked along beside the Kieler Förde. 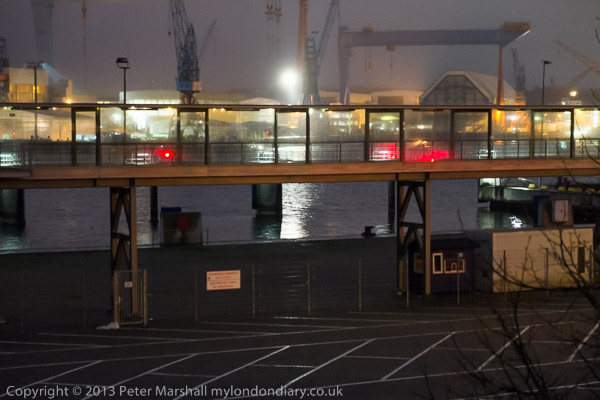 Unlike most British former ports, it still seems to be keeping busy. 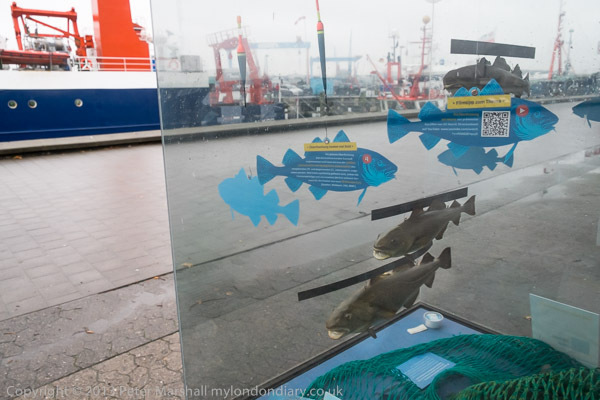 And there were some fish too, along with sea-monsters (you can see them on My London Diary) but it was too cold to hang around and we walked as quickly as possible into the city centre for coffee and cake. Although Kiel was founded in the 13th century, little remains of the old city, thanks to the visits by the RAF and USAF who between them destroyed over 80% of the old town, and little of the post-war development appears memorable. 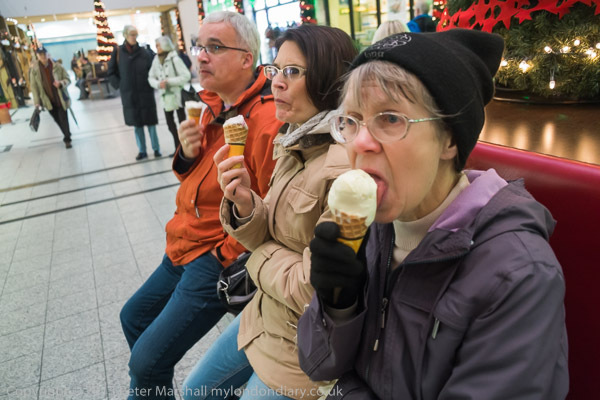 It boasts one of the longest shopping streets in Germany, but given the weather we were glad to get off it and into one of the larger shopping centres, where we soon warmed up enough for some rather delicious ice creams – with a bewildering choice of flavours. Giovanni L has over a 100 flavours and has won various ‘world championship’s as a master ice-cream maker and is now widely franchised across Germany and branches elsewhere, but despite that I can recommend ‘Mozart Praline‘, which comes ‘mit Marzipan‘, though I’m sure many of the others are delicious too. The ‘L’ stands for Lasagna, which seems confusing. 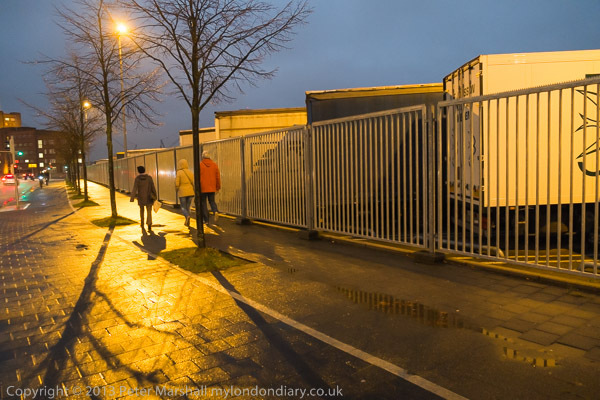 But the more interesting pictures to me were those I took in the dark on the way back to the car park. Of course these were hand-held, although some I was able to rest on a rail. Those here were taken with an exposure bias of -2/3 stop, and all with the 18-55mm zoom on the Fuji X-E1. Its a lens where the maximum aperture changes with focal length, and these were all wide-open. The corners are reasonably sharp despite this. The light sources in the images needed some considerable burning in. 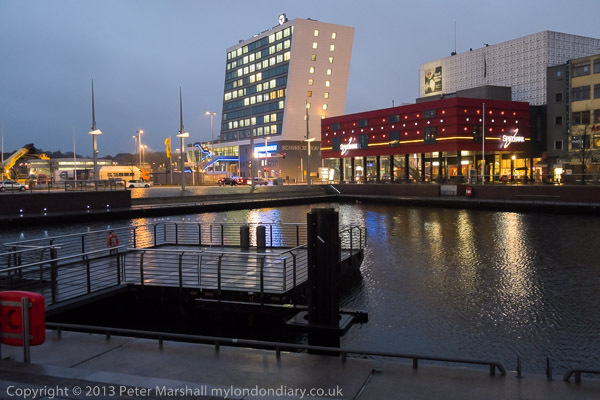 There are a few more on My London Diary – you can go direct to the Kiel pictures here. It was still raining, and we were hurrying back to the car, so I had to take pictures quickly and then run to catch up with the others. This entry was posted on Sunday, December 15th, 2013 at 12:41 pm and is filed under My Own Work, Photo Issues. You can follow any responses to this entry through the RSS 2.0 feed. You can leave a response, or trackback from your own site.